Whenever I have the privilege of having some fresh salmon fillets in my fridge, I always feel anxious. Such gorgeous pieces of meet, not cheap, are sitting there like diamonds in the rough. I can imagine how a jeweler feels with a priceless gem, wondering how best to cut it. It being January, salad has not been on the menu for a long while, and even veggies have been hard to spot in our household lately. A healthy combination like spinach and salmon seemed to be in order (especially since our family is recovering from a series of colds and flus and could use some good vitamins). I'm not a big salad fan, but let's just say this...I put some leftovers in a container to take for lunch the next day and they didn't make it past 8 PM. 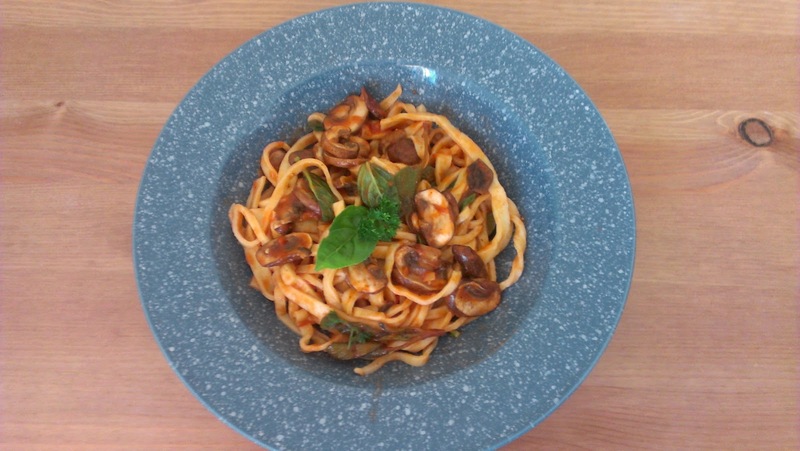 And, to be honest, this is one of my FAVOURITE recipes that I've posted so far. Taste the sauce to make sure you have a good balance of salty, sweet, and acidic. Marinate the salmon fillets in the sauce. I did this while preparing the salad, so it was only about 10 minutes or so, but seemed to be sufficient. On medium heat, add 1-2 TBSP of sesame oil with 1-2 TBSP of olive oil. Sesame oil gives the salmon a super flavour, but a) it burns quickly, so some olive oil is needed, and b) the flavour seems to burn off a bit, which is why I dressed the salad with sesame oil as well. Grill the salmon fillets on medium. Pour any extra sauce over the fillets while you are grilling them. I HATE overdone salmon, so remember that your salmon fillets CAN be slightly pink in the middle (like a steak) without risk (CAVEAT: IF you get them at a good store. I'm not responsible for any food poisoning if you buy them half-rotten at a crap shop!). 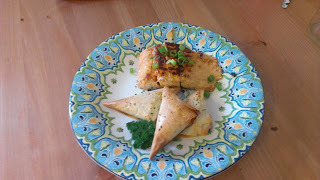 This makes the salmon so juicy and flaky, that it just falls apart in your mouth like melting butter. Wow. Nevertheless, at the same time that I was contemplating making my first paella, I was also researching other European recipes--rataouille, in specific. 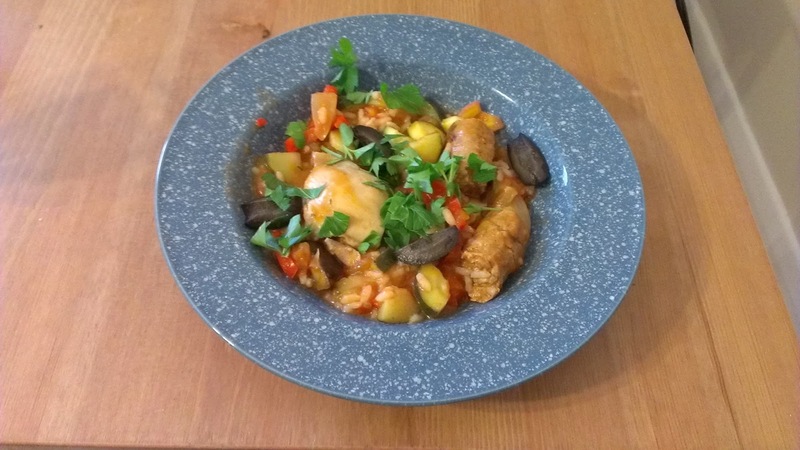 I've made the French vegetable dish before, but (most certainly because I did a poor job, and was not eating a dish made by a native of Nice), I felt something was lacking. While researching ratatouille, I discovered that the Spaniards of La Mancha make a similar dish called pisto. There's not too much of a difference, except they frequently add poached or lightly fried eggs on top and manchego cheese. Well, being North American, where our cuisine is all about fusing different cultural dishes together, I decided to make my own conflated dish called Pisto Paella. If you're Spanish, feel free to freak out in the comment box! I'm curious to find out what you think of this! Personally, although I did miss the saffron and paprika spices in the end, I quite loved it, and not only did it make a huge dish that will last for several days, it also provided me with a delicious spiced tomato vegetable soup! Quite an economical recipe. For the paella, sear the chorizo and chicken thighs in olive oil on medium-high heat. Put the meat in a stewing pot, then add half the tomato sauce and cover with chicken stock. Add the rice and put on low heat to simmer. For the pisto, in a sautee pan, add some olive oil and then add the onions and garlic. Sautee until soft, but be careful not to burn the garlic. Once the onions are soft, add the rest of the veg. Then add the other half can of tomato sauce and a little chicken stock. Simmer till cooked, but not mushy. Serve the pisto paella with a generous sprinkling of coarsely chopped coriander. And disfrute de su pisto paella!! Enjoy your pisto paella! There are several ingredient mixtures that just are indicative of what heaven might be like. I've got to admit that my all-time favourite ingredient combo is mushroom-garlic-bacon. But a close second is...spinach, ricotta/feta, and phyllo pastry. A match made in heaven. Hello! Since making a spinach/ricotta ravioli a few weeks ago, and also indulging in a spinach/feta phyllo coil from the grocery store, I became obsessed. 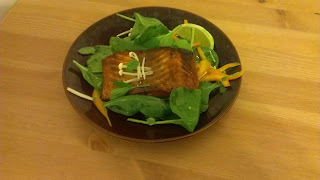 Similarly, I give kudos to my sister-in-law, who is a fellow foodie, for inspiring me to experiment with salmon and citrus. Mix the sauce ingredients. Heat a saute pan with 3 tbsp olive oil on low-medium until just starting to smoke. Lay the fillets, skin-side down, on the pan. Drizzle all the sauce over the salmon. Cook the salmon till 2/3 done while skin-down. Continually baste the top of the fillet with the sauce. You'll notice that the sauce becomes sticky and gooey as you cook the salmon. Don't worry if the salmon is still slightly pink in the middle when done. As long as it's hot all through, it's fine. And what's more, it will be a LOT more juicy! Once done, sprinkle the chopped spring onions over the fillets to add a zingy onion flavour that will balance out the citrusy tartness. DISCLAIMER: I am not Greek. I don't even know if I spelled spanakopita properly. However, I DO know that usually spanakopita is made with feta, not ricotta. And there's a good reason. Feta is much more briney, whereas ricotta is not salty at all. But since I had leftover ricotta, I substituted it. But added a LOT of salt. Thaw the phyllo and spinach till room temperature. Pull out two sheets of phyllo pastry and cut in 1/4s lengthwise and brush with melted butter. Cover the remaining phyllo with a damp cloth. Squeeze the excess water from the spinach with a cheese cloth. Mix spinach, ricotta, garlic, and salt. Put a large tablespoon of the mix onto the bottom of a phyllo strip and fold in alternating triangles to the top. (Think of making a child's paper ornament). Once all the spinach and ricotta mix is packaged into neat little triangles, brush with butter, and place on a lightly greased baking sheet. Sprinkle with oregano and bake for 10-15 minutes in a 375 degree oven till crisp and golden brown. I guarantee there won't be any leftovers! For several days now, I've been craving Thai food. Now, my family is pretty traditional when it comes to food. As my husband says, "I prefer food from Europe..." And my daughter is pretty much stuck on ham sandwiches with mayonnaise. But knowing I had these amazing ingredients in my fridge...tilapia, cilantro, ginger, lemon grass, lime, snow peas...my craving became unbearable! However, despite my apparent bravado, I sincerely doubted that I could produce anything similar to Thai food, no matter what ingredients I had. And to admit it, I've never tasted authentic Thai food, so probably I didn't. But regardless of what I made, it was freakin' awesome!! I DID try to take inspiration from Thai cooking. And, being super WASP, I probably fused a variety of Asian foods (and maybe, for my sweetie, there was some Italian in there!). Add the coconut milk and 1 cup of water to a pot and bring to a boil. Add the rice and saffron. Keep adding water until the rice is done. Add salt to taste (it will probably be more than you estimate as the coconut milk makes the rice quite sweet.). Just before serving add the chopped cilantro. Blend well. Taste constantly to make sure you have equal parts of sweet, sour, hot, and salty. Heat a pan with two tbsp of peanut oil on medium. Once hot, add 3 diced fillets of tilapia (or any other fresh fish). If necessary, put a lid over the mixture to steam it till done. Add the curry sauce to the fish and veggie mixture. Sautee on low heat till the fish is done. 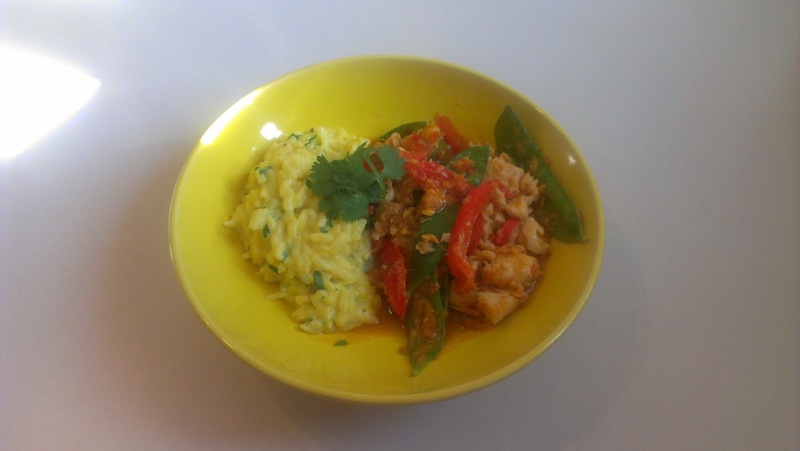 Serve the curried fish with the saffron, cilantro, coconut rice....YUM!!!!!!!!!! The are several reasons why I have not blogged in a while. One of them being that work has been insane, but the other, more pertinent factor is that I went vegetarian for two months. Sorry to my Veggie friends, but I completely lost my inspiration for cooking when I couldn't sear, braise, grill, or sautee. I know...there's such a thing as grilled tofu and sauteed veg, but I found myself gravitating to bread and peanut butter sandwiches and pasta for dinner. I guess to be vegetarian it would help to love vegetables. I DO love some veg, but only if it's accompanied by meat, I suppose. That being said, I still believe in the reason I went veggie in the first place... I wanted to protest factory farming. Look it up if interested. If not, this is not a soapbox, so don't worry. Although, if you want more information, see: http://beyondfactoryfarming.org/. (PS: For local readers in the KW area, I would love to discover more friendly ways of eating without breaking the bank. The Healthy Butcher is all well and good, but Healthy Butcher=Sick bank account). REGARDLESS...I am now back in cooking heaven, and as the title suggests I've realized that my cooking like my fashion has phases. Sometimes I dress punk for weeks at a time and then will go to work in slacks and a sweater...or even yoga pants. Similarly, a few months ago I was into survival food. And I don't mean trail mix. Our family really enjoys survival shows like Man vs. Wild, Dual Survivor, and Survivorman. I started buying frog legs, and learning how to gut and fillet a whole fish. It was so much fun, I even thought of making escargot from the snails in my back yard a la Gordon Ramsay. Unfortunately, I think the little buggers are so cute, that they're almost like a collection of backyard pets. So after my veggie stint, what's the new fad? Meat of course, but also homemade pasta!! 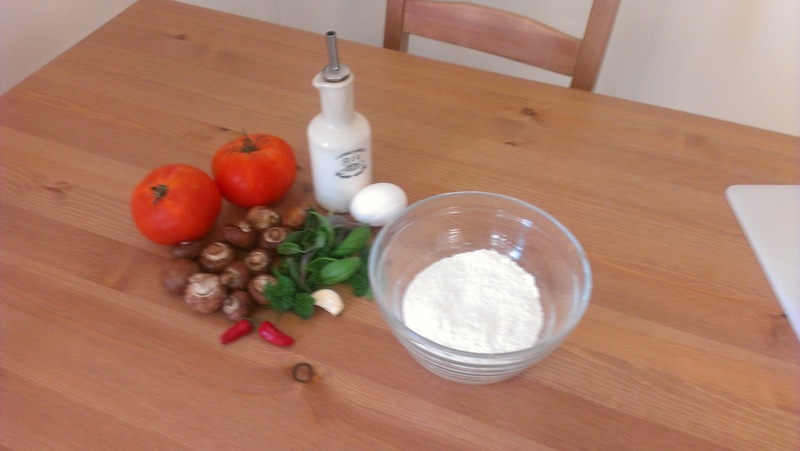 My husband watched a Jamie Oliver show that describes how simple it is to make homemade pasta, and we've been experimenting with it ever since. Kneed. Roll out. Roll up. Slice. Dump in boiling water for 45 seconds. Done. It was delicious. 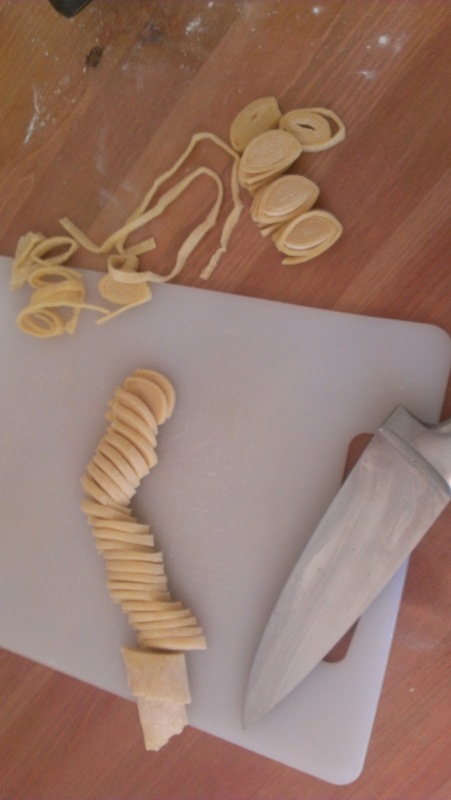 One thing I would recommend though, if you're going to be doing this alot, is to invest in a pasta roller (it's on my birthday list!). You can roll and roll and roll till you finally understand how the Italian mamas got so muscular, and you still won't be able to get it as thin as a roller. And with fresh pasta, it puffs up a little when it's boiled. 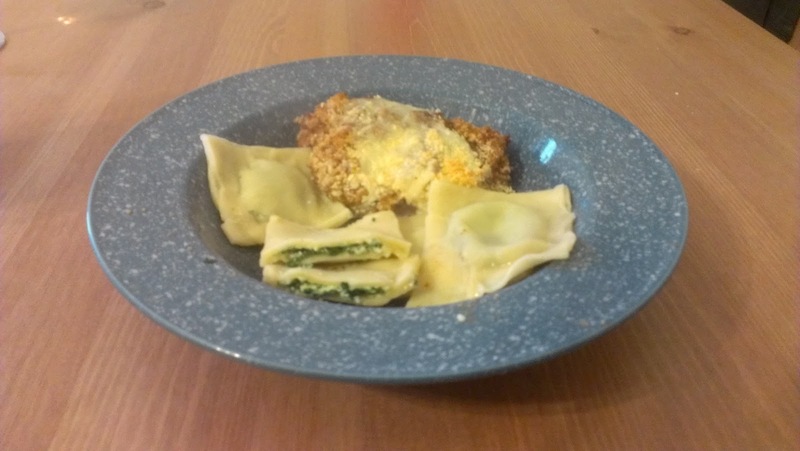 Yesterday, to continue with my pasta/Italian theme, dinner was chicken parmesan with homemade tomato sauce and spinach and ricotta ravioli. 2 cups bread crumbs (I didn't have any French bread, so I toasted several slices of whole wheat bread and blended them in the food processor). Dip each piece of chicken in the egg/milk mixture. Coat thoroughly with breadcrumbs. Place the pieces on a baking sheet covered in tinfoil. After about 10 minutes, reduce the heat to 350. Remove from oven. Pour 1/2 of the tomato sauce into a 9 x 13 pan. Place the chicken pieces over top. Then pour the rest of the sauce over the chicken pieces. Cover each piece with a significant amount of shredded mozzarella and then sprinkle a generous amount of parmesan over top. Bake for another 10 minutes. Use the same pasta recipe as above, but this time, after rolling out the dough cut it into ravioli-sized squares. Sautee 1 minced clove of garlic and 2-3 cups of spinach in olive oil until the spinach is wilted. Mix the spinach with the ricotta. Dab approximately 1 tbsp of the mix on a pasta square. Wet another square with water and press it over top of the square with mix. Ensure that all air is removed from the pocket and that the edges are tightly sealed. Drop in boiling water and allow to cook for 2-4 minutes. My shellfish-allergic husband recently got braces and is on a strictly mush-and-soup diet. So...I figured what better time than to cook up a seafood risotto? My daughter has an almost ridiculous obsession with seafood, and I must say, her adventurousness has challenged me to delve into the depths a bit more myself. I bought a bag of frozen shrimp (sorry! as much as I LOVE fresh ingredients, fresh shrimp are just too expensive! :S) and knew I had a bag of frozen mussels in the freezer. Okay, for all you seafood culinary know-it-alls, I get it. But a dear friend of mine (who has cooked seafood alot), told me it was okay to freeze fresh mussels. Maybe it is, but it didn't work for me. Although I planned to cook my risotto in a lovely mussel broth, after several minutes with my mussels still remaining stubbornly tight-lipped, I realized they were goners. Resorted to veggie stock....sigh. Regardless, I must say this dish turned out delightful! My one mistake was that I should have actually made MORE risotto. Still, not sure if it would have been eaten, since once my daughter was finished her first helping she made me pick out as many shrimp as possible for her second! Melt the butter over medium heat. Saute the chilis and green pepper. Add the risotto and toast slightly. Add the white wine and the saffron threads. Then add the stock slowly until the risotto is fully cooked. Meanwhile in a separate pan: Fry up the shrimp until about 1/2 done. Then add to risotto when it's halfway cooked. Once risotto is fully cooked add spinach, seasoning, and juice of 1/2 lime. Mix till spinach is slightly wilted. Serve with a wedge of lime. YUM! After my culinary crisis of last weekend, I decided to do something I rarely do...cook a recipe that I've done before. Tried. Tested. True. Yes, so my epicurean ego was slightly damaged and needed assuaging. Nothing spells redemption quite like risotto. Or maybe it's just me. Being of Mennonite background, risotto used to be as unfamiliar to me as a pierogi is to an Italian. (Though the word does look suspiciously Latin!) The first time I heard of risotto was on Ramsay's Hell's Kitchen and it became my new Everest. I mean, how many times have you seen Gordon Ramsay slop around a risotto appie and then yell out one of the following: "It's RAW!!!" or "BLAND!" 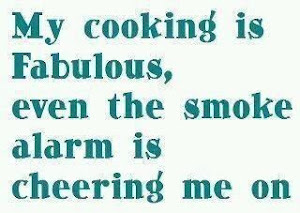 or "Overcooked! It's MUSH. Get the **** out of my kitchen!" Somehow I got the idea that if I could make a good risotto I could honestly consider myself an amateur cook. Now, on this International Women's Day, I must confess that the my very first risotto attempt was made while entertaining a (dear) friend, who tried to convince my husband that women belong at home and in the kitchen. So I will have to admit that on that particular occasion the risotto got stirred a bit faster than it should have, and was not a particularly relaxing experience. However, that being said. The risotto did turn out, and I think the act of constant stirring actually calmed me down. In fact, over the last couple years I've found that making risotto is an extremely relaxing and therapeutic process. It's lengthy, and I know it sounds weird, but the act of slowly adding stock, and stirring and stirring is an ideal relaxant after a long day of work. Saute the onions in 1/4 cup of butter. Add mushrooms and garlic. When slightly tender, add white wine and saute until wine is completely reduced. Set aside. Saute onions in butter. When onions are slightly soft, add rice and toast slightly. Add white wine and stir until absorbed. Continue to add stock at about 1/2 cup at a time; each time stirring slowly until the liquid is absorbed. When all the stock has been added and absorbed, test the risotto. Some prefer it more al dente, although I like mine less "crunchy". Add the mushroom mixture to the risotto and add seasoning. If you really want to be decadent, add 1/4 cup parmesan and stir until melted. YUM! This is a HUGE recipe. Ideal for serving about 10 people, so adjust accordingly. Because risotto is so time-consuming and attention-consuming, my favourite meat dish to serve it with is something that matches the classiness of the risotto, but is actually pretty easy. In the summer, I generally make my own basil pesto, but you can also buy basil pesto at any grocery store. Simply slit the breast 2/3 open lengthwise, stuff with 1-2 teaspoons of pesto and then wrap the breast in bacon. For a leaner option, wrap in prosciutto. It's fewer calories, but the chicken will be a bit drier. Bake at 400 degrees for about 40-45 minutes....et voila! Seriously people, is there a better combination on earth than mushrooms, bacon, and garlic??? ?